Xbox One X 1TB Metro Saga Bundle is rated 4.5 out of 5 by 11. Pre-order the Xbox One X Metro Saga Bundle and shoot, sneak, and survive your way through the apocalypse. Immerse yourself in this haunting, atmospheric world spanning three complete games where every choice has a consequence, and your wits and stealth matter just as much as you're shooting skills. 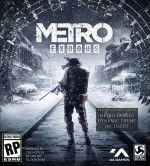 Begin with the full-game download of Metro 2033 Redux, then take the saga to its conclusion through Metro: Last Light Redux and the all-new Metro Exodus, where you flee the ruins of the Moscow Metro and embark on an epic journey across post-apocalyptic Russia. Experience sandbox survival explore a hostile world and engage in deadly combat in the award-winning series. With 40% more power than any other console, a library of over 1300 games, and true 4K gaming, games play better and are more immersive on Xbox One X.